Your dog’s eyes are delicate organs and require adequate attention to cleaning and caring for his eyes. Always consult with a veterinarian if you suspect your dog of having an eye issue. Dogs can be susceptible to conjunctivitis, a bacterial infection which affects the thin membrane covering the front of the eye called the conjunctiva. It causes redness and dryness in the eye or eyes. When your dog’s eye is inflamed, it will tend to result in a thick fluid which clogs up the front of the eye and makes it hard for your dog to open his eyes. Treatment is very quick and effective and is usually cleared up with a short course of ointment which can be prescribed by your vet. There are a number of diseases and conditions which can affect your dog’s eyes – the main being cataracts. Over time, this could lead to total blindness in the affected eye. Glaucoma occurs when there is an increase in the pressure within the eye. When there are irritants or foreign bodies in the eye tissues, the constant irritation can lead to corneal ulceration and a change in the surrounding tissues. Ectopic Cilia: an abnormal eyelash that grows through the conjunctiva and is usually very painful and almost always causes an ulcer. Distichiasis: abnormal position of eyelashes on a lid margin that result in irritation of the eye. Dermoid: congenital defect where haired skin is located in an abnormal place on an eye and will often irritate the cornea and can cause ulcers. Cataracts: opacity of the lens. Inherited cataracts can often appear in young dogs, in most cases a veterinarian or veterinary ophthalmologist will have to make this diagnosis; owners are often unaware of small focal cataracts. There are also late onset cataracts that may not show up until middle or older age. Follicular Conjunctivitis: itchy, reddened conjunctival tissues, tearing, squinting, often related to allergies. Puppy Pyoderma or Puppy Strangles: eyelid abscesses associated with generalized skin pustules. Dry Eye (Keratoconjunctivitis sicca or KCS): lack of or inadequate production of tears. Sometimes this can be congenital in which case it is often very serious. Pug, Lhasa Apso, Shih Tzu are some of the breeds that may be born with dry eyes. On many light colored dogs, especially miniature and toy breeds, you may see a brown or pink stain on the skin and hair below the inside corner of the eye. This is a common problem caused by an overflow of tears. The color change of the hair and skin occurs when the normal bacteria on the hair and skin react with the clear tears. There are many causes of the overflow of tears. Miniature breeds and Persians often have more prominent eyes. This stretches the eyelid and may cut off the drainage system. This is the most common cause, and there is little we can do to correct it. Other causes could be an irritant in the eye, an allergy, or an abnormal eyelid or eyelash. Besides being alert to dirt that could irritate your dog’s eyes on a daily basis, a thorough check on your dog’s eyes should be incorporated into your routine when you do your weekly checkups on him. This will allow you to pick up any problems with his eyes as soon as possible. Making sure his eyes are clean is the first step to good eye care. The more you can reduce the possibility of infection and disease the healthier your dog will be and the happier you both will be. For wiping the eyes, JasperandZoe.com recommends Happytails EyePads, and we have been using them on our puppy Jasper to reinforce his healthy eyes. The EyePads are pre-moistened to remove the tearing residue from around a dog’s eyes. Rub with and against the grain of the fur for maximum effectiveness. The pads are infused with eyebright that helps clean away the discoloration and all natural colloidal silver that inhibits the growth of the bacteria that cause it. Jasper loves it, because it is alcohol free, gentle, and tearless. It contains no pharmaceuticals or chemicals. 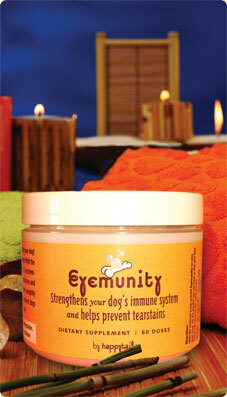 The EyePads are especially effective when used together with Eyemunity to boost your best friend’s immunity. Eyemunity is a nutrient-rich, high-metabolite immunogen that helps to strengthen your dog’s resistance and maintain wellness. Sprinkle power on your dog’s food everyday. The unique formula contains Epicor, an ingredient which has been clinically proven to boost immunity in both animals and humans. Eyemunity will support your best friend’s fight against stain-causing bacteria while also improving his overall health. Happytails EyePads and EyeMunity can be purchased individually or as a package on www.JasperandZoe.com. For a limited time, get 10% off Happytails EyePads, EyeMunity, EyePack and other Happytails products. Enter code HAPPYTAILS at checkout. Is your dog prone to ear infections? Does your dog shake its ears or shake its head a lot? If so, your dog most likely requires treatment. Ear infection in dogs can be caused by several factors. It could be ear mites, bacterial infections, food allergies, unhealthy environments, and improper dog hygiene. A good sniff near the ears usually verifies a problem, as most infectious ears are quite pungent. Ear infection is very common to dogs with flopped ears. Cocker spaniels and poodles are examples of dogs most prone to this disease. Proper grooming will help, and regular checking of your dog’s ears is critical. However, your dog’s ears are sensitive, so if you are unsure what to do, do not attempt to poke around with Q-tips. Consult with your vet. There are three types of ear infection in dogs – the outer ear infection, middle ear infection, and the inner infection. The outer ear infection is easily noticeable, as it is usually characterized by inflammation and foul-smelling wax discharge. The middle and inner ear infections are more severe and require the help of a veterinarian because the condition can worsen and are often not curable unless special treatment procedures are administered. Proper ear care for the dog can often prevent recurring infection. Dogs with a history of ear disease require routine cleaning of the canals. Plucking hair that grows in the canal will help, as hair impedes air flow into the canal that tends to keep the canal dry. Again, if you are unsure how to pluck, do not attempt to do it at home. Instead seek the help of your groomer. Good preventative ear care can eliminate needless trips to your veterinarian and save a lot of discomfort for your dog. At JasperandZoe.com, we want your dog to be healthy and happy. With this in mind, for an all-natural and safe solution to keeping your dog’s ears clean and yeast-free, we highly recommend HappyTails Ear Wipes ($13). The pre-moistened, alcohol-free pads clean and deodorize. They contain colloidal silver, an all-natural ingredient that suppresses bacteria, and witch hazel, used for generations to safely cleanse and sanitize. The botanical blend removes dirt, wax and debris while reducing unpleasant odors. Contains no pharmaceuticals or chemicals. Our pup Jasper uses HappyTails Ear Wipes. Shouldn’t yours? For a limited time, get 10% off HappyTails Ear Wipes and other HappyTails products. Enter code HAPPYTAILS at checkout. Puppia Soft Harness – The best, most comfortable harness! My puppy Jasper recently developed a limp, but he is getting better. I attribute part of his recovery to the Puppia Soft Dog Harness I recently got for him. Not only does he look handsome in it, it helps to provide extra support and comfort when he walks. The harness is soft padded, made from a soft polyester air-mesh and has a resizable chest belt to assure a perfect fit for him! Why wear a dog harness? Dog harnesses spread the pressure of a leash beyond your dog’s neck, so they are perfect for pulling dogs or dogs who choke against traditional collars. Harnesses are especially beneficial for small dogs to reduce the stress placed on their neck while walking on a lead. But large dog harnesses are just as useful. Most harnesses have a wide range of sizes available. Remember to measure your dog’s girth, just behind his front legs. Jasper likes this Puppia Soft Harness not only because of its sporty look but also because he loves to pull, and the harness exerts no pressure on his little neck. Whenever he sees the harness, he gets so excited and wants to get right into it. Jasper even responds well to training with this harness. I would correct him on a walk with a side pull like Cesar Milan teaches, and it’s great, because he responds well without choking or having his neck pulled! Plus, when the harness gets dirty, you can easily throw it in the washer. Overall, I find it to be the best harness on the market – it’s comfortable, attractive, functional, easy to snap on and off, and it comes in cute colors! Four paws up from Jasper! If you would like to buy this harness or other harnesses, visit www.JasperandZoe.com.